Damion F. in the UK found this somewhat frightening guy on eBay and I think he’s amazing. It looks to be hand-carved. Maybe a souvenir brought back from an exotic trip long ago? 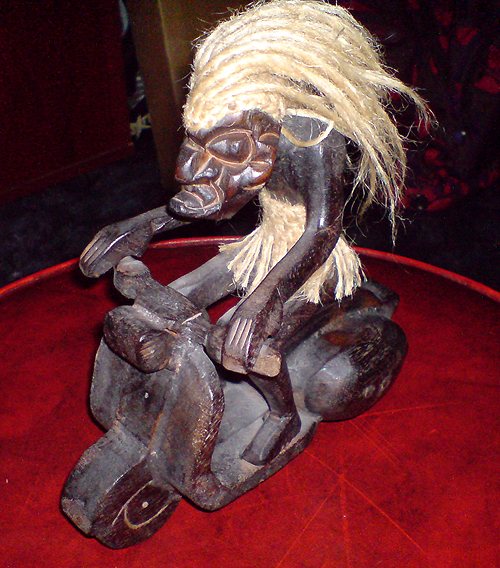 This entry was posted in Decor and tagged scooter, vespa, witch doctor by Tracy. Bookmark the permalink. I received one of these for my Bday a couple of years ago. They were sold here in the US but the name of the store escapes me. Oooh. If you think of it, please let us know! The name of the store was World Market, a Pier 1 Imports competitor.